cut it away from Aston village. Today the River Tame seems to skirt past the Aston area; taking a sharp turn under Witton Bridge, and then creeping behind the houses and industries of Tame Road, only to emerge under the Aston Expressway at the other end of Witton. But the old village of Aston grew up along the river, its shape determined by it and especially a large meander, later called the Serpentine. The Tame and its meander formed the north-east border of what was called Aston Manor, a smaller administrative division in the huge parish of Aston, set out at least by the time of George III. * This watery boundary line stretched from Witton Bridge (where the Shire Brook once joined the Tame, forming itself the north-west boundary) to just past Salford Bridge, where the Hockley Brook comes in (which formed the south-east boundary). 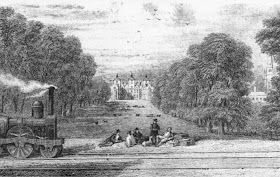 The Manor of Aston contained the central hub of Aston Parish; the village, the parish church, and the great manor house called Aston Hall (with its historic deer park), but when the Grand Junction Railway was driven through the area, it drew a line separating the river from Aston Manor. The Serpentine, the meander which lurched too deeply into the village of Aston, was also cut away by the railroad, and left as a motionless arc shaped pool. More pools formed at its centre, and the nearby Aston Tavern utilised the picturesque ‘Old River Tame’ at the bottom of its sloping ornamental ‘tea gardens’ and platforms were erected for fishing (which was, apparently, excellent, and one of the favourite spots around Birmingham). 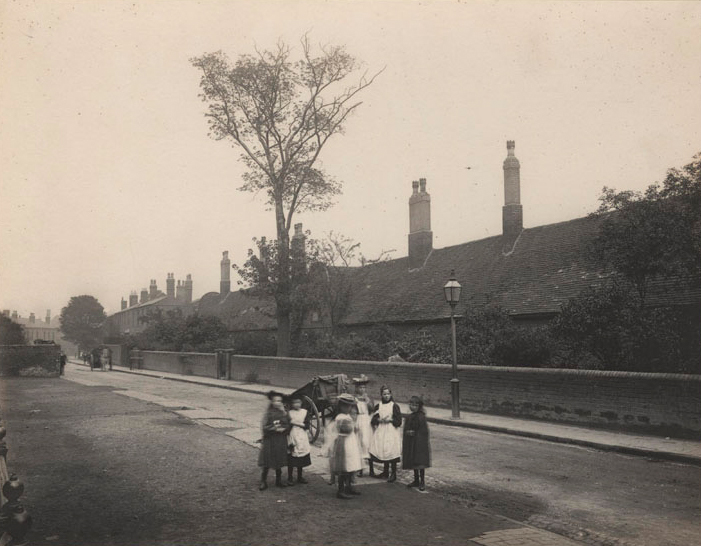 Further from the Tavern, boathouses were built, and you can imagine summer afternoons with the paddles sweeping against the water, and Victorian ladies reclining with their parasols. 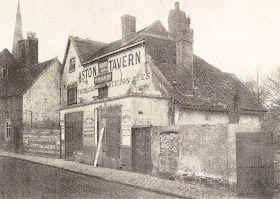 It was described in 1838 that the Aston Tavern attracted “a great deal of company in fine weather, from the pleasantness of the situation and the taste displayed in the laying out of the ground”. 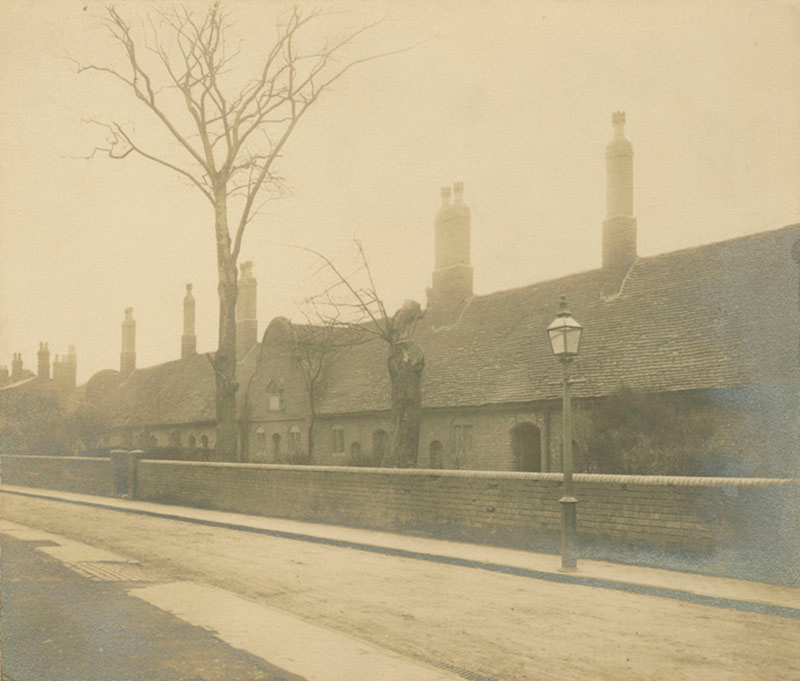 Its situation during the nineteenth century was a fine one; it stood with a number of other buildings (some timber-built Tudor constructions) along what was called Aston Street (now Witton Lane), with the Holte Almshouses (completed 1656, see images below) standing opposite. 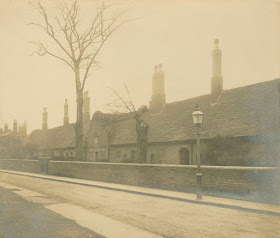 the Holte Almshouses on the other side. with the spire of Aston Church behind. Moving the River Tame, in 1838, was not the easiest of tasks. The new course was dug out, but the railway line needed to be raised on an embankment to protect it from floods (where it still resides) which kept collapsing, as the riverside ground consisted of thousands of years of soft river deposit. 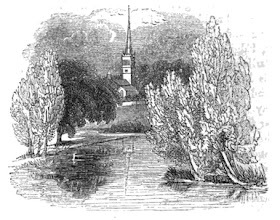 It was the local gravel that saved the day, and was built up to form a firm foundation for the embankment that would support the heavy traffic on top. These setbacks caused a substantial delay, and the workmen worked “by sunlight and by moonlight” to get the line ready for its official opening. There has been a settlement near the river here since at least Saxon times, with a moated manor house on the banks of the river just south of where Witton Bridge is today; this was early Aston, though the Saxon’s called it Enstone. Although the house had disappeared, the moat was still drawn into the ground in the days of Birmingham’s first historian, William Hutton (1782), who noted that the trenches were often flooded by the river. After the Saxon’s fell, the Domesday Book describes 44 inhabitants, one being a priest (suggesting that the church was already built), as well as a mill, which would have been water powered and situated along the Tame. Although probably older, evidence of the village on the banks of the Serpentine Tame can be traced back to the thirteenth century, with finds of pottery (such as cooking pots), a medieval stone wall, and what seem like drainage channels to the river discovered during archaeological digs. Traces of an orchard from the fifteenth and/or sixteenth centuries were also found. 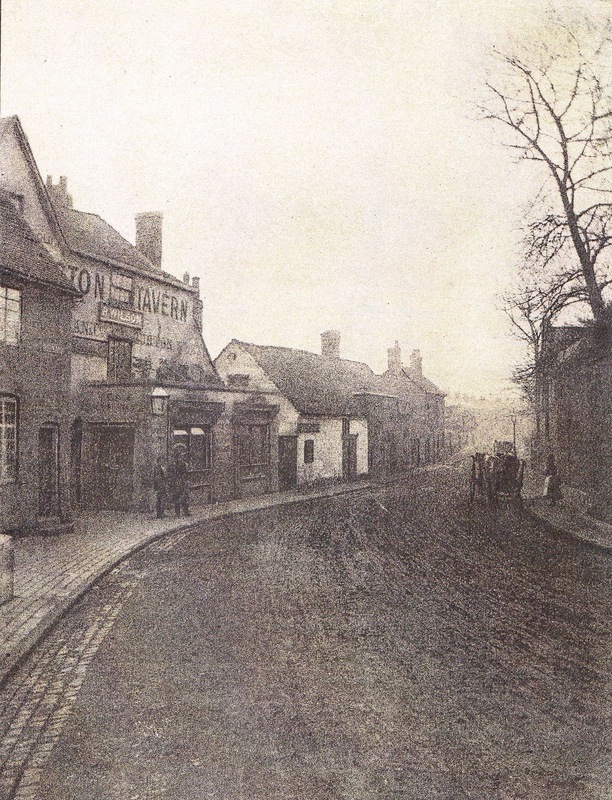 It is also possible that a predecessor to the Aston Tavern may have stood on the site in the eighteenth century, as drinking vessels and handled mugs from that period were found during excavations. Aston Hall with the Grand Junction Railway passing. In more modern times, the great curve and pools of the Serpentine began to silt up and were eventually filled in. 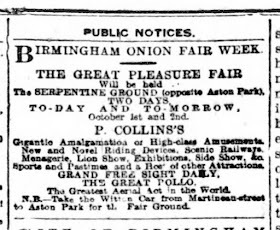 In the 20th century the ancient Onion Fair was moved out of the city centre to the suburbs, and by 1914 had moved to the ‘Serpentine Grounds’. The annual fair remained on this site till about the 1960s or early 1970s. 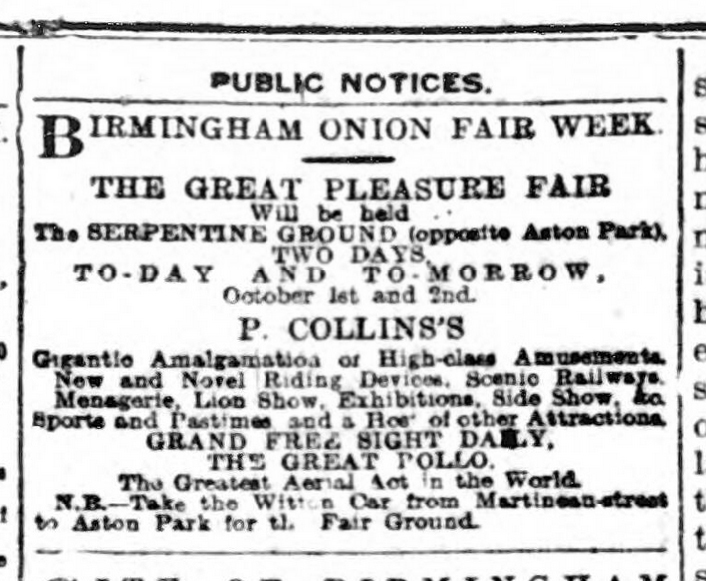 Birmingham Onion Fair Week. Birmingham Gazette, 1 October 1915. 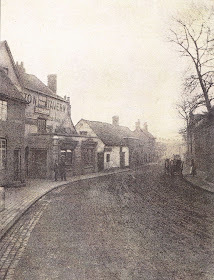 * The parish of Aston was huge and contained a number of administrative divisions: these were Bordesley, Castle Bromwich, Deritend, Duddeston & Nechells, Erdington, Little Bromwich, Saltley & Washwood, Witton and Water Orton. Only Bordesley and Deritend (and the Duddeston part of Duddeston & Nechells) did not have the River Tame as part of their boundaries.